I like the holiday meal to be EASY. In recent years I have been skipping the mashed potatoes and doing stuffing instead. As a working parent I need to maximize time with my family and not squander it in the kitchen prepping elaborate meals….don’t get me wrong, I still want the meal to *taste* like I spent a ton of time making it! I admit to taking my help from a box on this one…namely Stove Top. But, with a few added sauteed veggies and some chicken broth, you can amp up the flavor, and get that boxed stuff to taste like it was homemade. Sautee onion, celery, red pepper, garlic, mushrooms in the olive oil. Add salt and pepper to taste. Go lightly with the salt since we will be using canned broth and butter later on ! 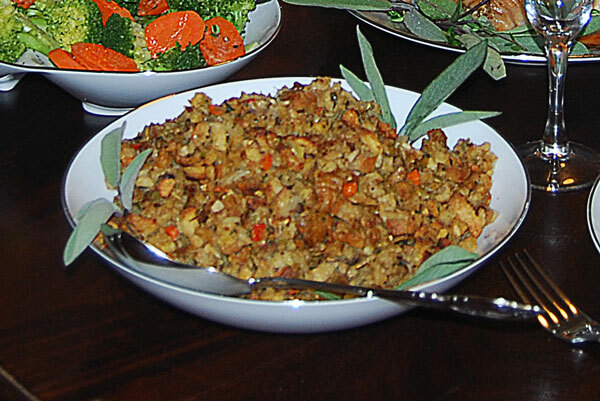 While veggies are cooking, take a look at the stuffing directions. Mine called for 3 cups of water and 1/2 cup (egads) of butter for a double recipe — instead, I used canned chicken broth in place of the water, and only 1/4 cup of butter. I brought this up to a boil, and prepared the stuffing per the package directions. Combine the stuffing and sauteed veggies in a 9×13 inch pan, and cook at 375 F for about 15 minutes to create a nice crunchy top. 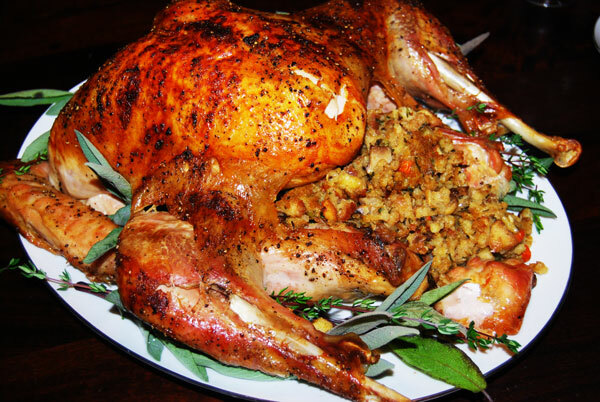 I never stuff a bird, since it increases the cooking time, so I prep the stuffing this way, and when plating up the bird on a platter, I just arrange the stuffing around the cavity.